Looking back over In Pursuit of the Past, which was published in 1983, I see that three themes stand out. Part I emphasizes that one needs to know something about what the world is like before trying to explain what one imagines it to be like. Clearly, if Raymond Dart had known more about predators and their behavior, as well as the consequences of this behavior for the character of faunal assemblages, he would not have made the arguments that he did. This problem introduced the issues and demonstrated that very productive research can be prompted by incorrect ideas. Part II of In Pursuit is about both the accumulation of knowledge and its use to "situate" present-day observations made about the archaeological record within the context of the dynamics of the past. Chapter 4, "The Challenge of the Mousterian," illustrates the character of the problem of referral from the present to the past. 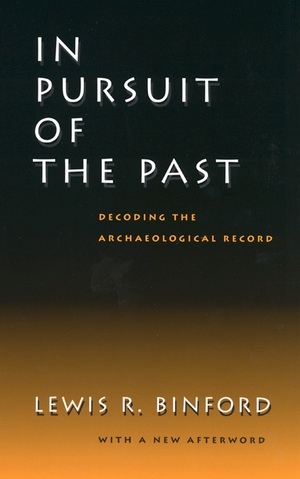 Chapters 5, 6, and 7 all present observations on living systems which were considered examples of what archaeologists needed to know before they could make accurate referral arguments and, in turn, seek to explain observed patterning in the archaeological record in terms of determinant processes operative in the past. Part III is an excursion into ideas cast at a different scale. Instead of discussing small-scale patterned events that might stand behind spatially differentiated segments of past systems, such as specific sites, Part III works on the scale of the evolutionary history of cultural systems. I set forth some ideas that had not been introduced before and were not well developed. They were "trial balloons" introduced in anticipation of arguments yet to come. Regardless of the scale of the discussion, most of the book was organized to influence or introduce ideas about doing archaeology that were at the time nascent and not widely practiced. After twenty years, it is reasonable to ask: What has happened since? Have any of these ideas been developed? Has the field moved in productive directions? What more do we know today about early man, the Mousterian, or how to deal with variability in the archaeological record? Perhaps the most important question is, What is left for today's students to tackle? If we focus for the moment on the Mousterian we see a curious phenomenon: an enormous growth in the literature with essentially very little progress! Several arguments have dominated the Mousterian discussion since 1983. One has been an alternative referral argument regarding the "meaning" of Bordes tool typology, namely that the differences between the morphological "types" recognized by Bordes are to be understood or "explained" simply as differentially reduced pieces and not really designed "tools" (Dibble 1984, 1988, 1992)! Dibble has in fact realistically recognized (1995) that his reduction sequences do not solve the problem of why associated items were differentially reduced. However, he has failed to recognize what can be learned by changing scales and examining the variability in site-structural terms, and at the inter-site comparative level using germane frames of reference (see Binford 2001: 55-204). A further instance of the lack of progress made on the "Mousterian problem" is the argument that there is temporally patterned variability in the Mousterian of France (Mellars 1989); this does not conflict with or extend my earlier arguments. One would expect activities to be organized differently in different environments just as one would expect differential activity associations in response to variable local conditions within a single system. There are exceptions to the no-progress claim, however, in the truly stimulating work of Steven Kuhn (1995) and Mary Stiner (1994), who continue to address real problems at appropriate scales. A third example of an area of little or no progress is the problem of the earliest hominids and the inferences made concerning their social organization, diet, and patterns of subsistence behavior. These topics have become hopelessly bogged down in speculation (see Pitts and Roberts 1998:291-293) on the relative "intelligence" of ancient species and the degree that we can assume behavior like ours at different time periods (see Lake 1996 for a discussion of some of the issues). In addition, there is the question of agency and the fundamental "unit" with which archaeologists should appropriately work. For a curious treatment of these issues see Clive Gamble (1999:1-64). Gamble concludes that the appropriate "unit" is the individual! The fact is that archaeologists' units are demonstrated forms of patterning derived from the analytical study of the archaeological record. In most cases it takes considerable behavioral repetition to produce a recognizable pattern in archaeological remains. Such patterning is, of necessity, the result of many individuals behaving similarly in different locations or venues. The different repetitive patterns must be convincingly integrated into a model of the organizational characteristics of past social forms. While such issues as the "proper" unit for discussing causation, or the confusion of a referral argument with an explanation, have deflected productive research, there are, nevertheless, growths in our knowledge both of the archaeological record and of the character of the past. I have in mind work by Blumenschine (1987,1991, 1995). However, in spite of considerable learning (see the many articles in the Journal of Human Evolution between 1985 and the present) there has not yet emerged a method for producing convincing warranting arguments regarding the niches occupied by early hominids. We are still seeking reliable ways of knowing what the worlds of the Neanderthal and earlier forms of hominid might have been like. As noted earlier, three chapters of In Pursuit are devoted to site- structural descriptions and demonstrations. What has happened since these chapters were written? There have been many publications by, for example, Kent (1987, 1989, 1990), Kroll and Price (1991), Gamble and Boismier (1991), Rossignol and Wandsnider (1992), and Whitelaw (1989). Nevertheless there has been no analysis of the data available, except for the early work of Whitelaw (1989). This area of research is badly in need of integrative analysis and pattern recognition work so that what has been learned about the world of site structure can be generalized in ways useful to archaeologists. I do not mean, however, synthesized in normative terms but instead comparatively studied so as to yield clues to what causes the variability that is currently documented. This type of work is badly needed, in fact, in most areas of archaeological research. What has happened since the publication of Part III of In Pursuit of the Past? There is absolutely no doubt that a great deal of knowledge has been accumulated of the archaeological record during critical time periods and from critical locations where major changes occurred. For example, due to work in the Near East by Ofer Bar-Yosef and his colleagues, we now know much more about the "origins of agriculture" from the archaeological perspective than we did twenty years ago. On the other hand there has been little progress in the character of arguments about such changes. I hope that this will change in the near future. After ten years of intensive research and writing, I have recently published a major work entitled Constructing Frames of Reference: An Analytical Method for Archaeological Theory Building Using Ethnographic and Environmental Data Sets, in which I build a theory of intensification processes with clear implications for anticipating where and under what conditions horticulture will be invented or adopted. I am very hopeful that this book will stimulate the further development of analytical methods and procedures that could move our field in intellectually productive directions. In Pursuit of the Past treated issues such as how to think about problems of the past that are investigated through archaeologically recovered "data." I sought to demonstrate that archaeologists needed to know more about the world of small-scale societies in order to think productively about what might possibly stand behind the variability noted in the archaeological record. At the same time I was concerned with how to use prior knowledge in general and with the role of ideas in the development of scientific methods for learning. Many of the ideas introduced in In Pursuit are in fact developed and demonstrated in Constructing Frames of Reference. While much work has been done on these topics in the last twenty years, most of the problems set forth in In Pursuit have yet to be resolved. Today's students have the potential to tackle such problems and make a real contribution to the growth of knowledge in archaeology. Binford, L. R. 2001. Constructing Frames of Reference: An Analytical Method forArchaeological Theory Building Using Ethnographic and Environmental Data Sets. Berkeley: University of California Press. Blumenschine, R. J. 1987. Characteristics of an early Hominid scavenging niche. Currrent Anthropology 28:383-407.
ñññ. 1991. Hominid Carnivory and Foraging Strategies, and the Socio-economic Function of Early Archaeological Sites. Philosophical Transactions, Royal Society of London, bulletin 334:211-21. Dibble, H. L. 1984. Interpreting Typological Variation of Middle Paleolithic Scrapers: Function, Style, or Sequence of Reduction? Journal of Field Archaeology 11:431-36.
ñññ. 1987a. The Interpretation of Middle Paleolithic Scraper Morphology. American Antiquity 52:109-17.
ñññ. 1987b. Reduction Sequences in the Manufacture of Mousterian Implements of France. In The Pleistocene Old World: Regional Perspectives, edited by O. Soffer, pp. 33-45. New York: Plenum. ñññ. 1988. Typological Aspects of Reduction and Intensity of Utilization of Lithic Resources in the French Mousterian. In Upper Pleistocene Prehistory of Western Eurasia, edited by H. Dibble and A. Montet-White, pp. 188-91. Philadelphia: The University Museum, University of Pennsylvania. Gamble, C., and W. A. Boismier, eds. 1991. Ethnoarchaeological Approaches to Mobil Campsites: Hunter-Gatherer and Pastoralist Case Studies. Ann Arbor, Mich.: International Monographs in Prehistory, Ethnoarchaeological Series 1. Kent, S., ed. 1987. Method and Theory for Activity Area Research. New York: Columbia University Press. ñññ. 1989. Farmers as Hunters: The Implications for Sedentism. Cambridge: Cambridge University Press. ñññ. 1990. Domestic Architecture and the Use of Space. Cambridge: Cambridge University Press. Kroll, E. M., and T. D. Price, eds. 1991. The Interpretation of Archaeological Spatial Patterning. New York and London: Plenum Press. Kuhn, S. L. 1995. Mousterian Lithic Technology: An Ecological Perspective. Princeton, N.J.: Princeton University Press. Lake, M. 1996. Archaeological Inference and the Explanation of Hominid Evolution. In The Archaeology of Human Ancestry, edited by J. Steele and S. Shennan, pp. 184-206. London and New York: Routledge. Mellars, P. A. 1989. Chronologie du Mousterien du Sud-Ouest de La France: Actualisation du Debat. L'Anthropologie 93(1):53-72. Pitts, M., and M. Roberts. 1998. Fairweather Eden. New York: Fromm International. Rossignol, J., and L. Wandsnider. 1992. Space, Time, and Archaeological Landscapes. New York and London: Plenum Press. Stiner, M. C. 1994. Honor among Thieves: A Zooarchaeological Study of Neandertal Ecology. Princeton, N.J.: Princeton University Press. Whitelaw, T. M. 1989. The Social Organisation of Space in Hunter-Gatherer Communities: Some Implications for Social Inference in Archaeology. Doctoral thesis, Faculty of Archaeology and Anthropology, University of Cambridge. Many consider Lewis Binford to be the single most influential figure in archaeology in the last half-century. His contributions to the "New Archaeology" changed the course of the field as he argued for the development of a scientifically rigorous framework to guide the excavation and interpretation of the archaeological record. In this book, first published nearly two decades ago, Binford provided students and general readers with an introduction to his challenging and provocative ideas about understanding the human past. Now available again, this important component of Binford's intellectual legacy will convey the drama and intellectual excitement of contemporary archaeology to a new generation of archaeologists and others interested in the field. Throughout the book, Binford questions old ideas and proposes new theories based on his comparative archaeological and ethnographic research in North America, Europe, South Africa, and Australia. 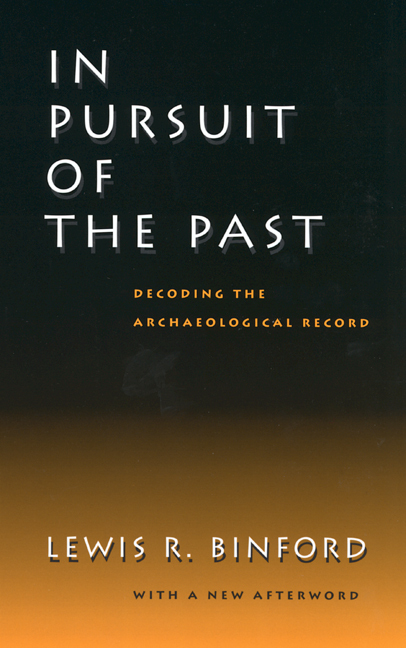 A new afterword by Binford surveys the direction archaeology has taken since the publication of this book and shares his hopes for the future of the discipline. Lewis R. Binford is University Distinguished Professor of Anthropology at Southern Methodist University. He is author of Constructing Frames of Reference: An Analytical Method for Archaeological Theory Building Using Ethnographic and Environmental Data Sets (California, 2001), Debating Archaeology (1989), Working at Archaeology (1983), and many other books. PART I: WHAT WAS IT LIKE? 2. Man the Mighty Hunter? PART II: WHAT DOES IT MEAN? PART III. WHY DID IT HAPPEN?